Hi Crafty friends, The last several weeks have kept me fairly busy. Just to name a few things happening round here lately, Firstly my birthday which flew by so quick. I have also been busy making 50th wedding anniversary invites, made lots of card projects and made another suncatcher for friends and family, which I will share with you soon. I have also done double duty with Christmas shopping (ours and also my sister in-laws) and had a Viral/Chest Infection in-between, just for good measure! Our new outside blinds are finally up, so we have privacy and protection from full afternoon sun and the elements. 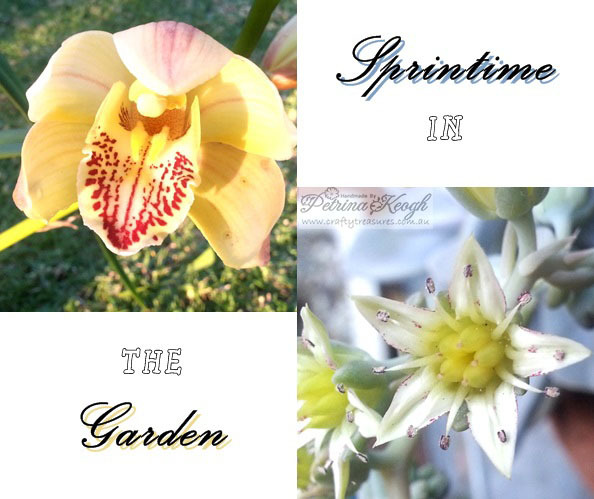 The courtyard painting, garden beds and plants are all coming together slowly and I sorted and organized all my clear stamps and a few unmounted rubber stamps… Yayy! 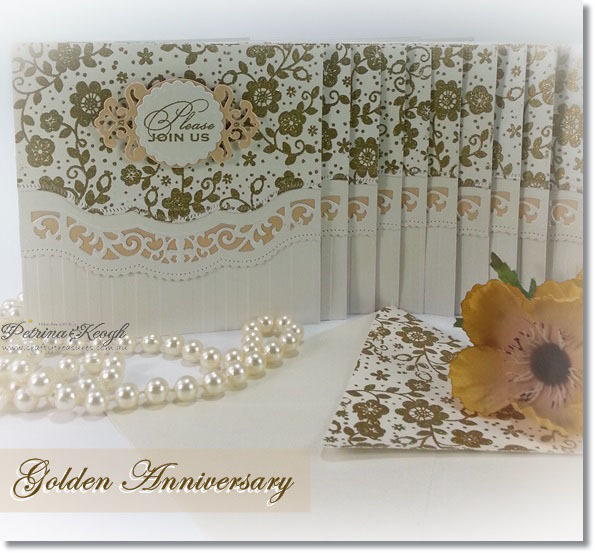 These 50th Wedding Invitations were made for a dear friend, who asked well in advance for them so they could be posted out in Oct-Nov.
All finished by the due date and envelopes addressed they were ready for posting to all the guests invited. Happy Anniversary Manfred & Jacomin! 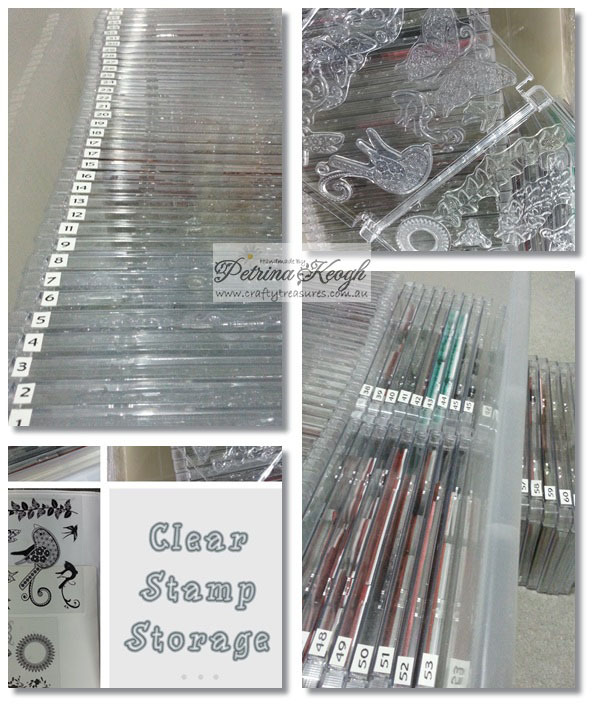 My clear and unmounted stamps have been bugging me for quite a while now, they are not what I call user friendly all piled by theme into zip style bags in a 50ltr storage container. I really needed to sort them, so I could access them easier. I had not attempted to sort them until I found the right storage solution for them, that suited my needs. Everyone has there own preferences and most often if you are like me, try to store these forever accumulating crafting goodies in an affordable way that works best and often with limited space. I sourced these wonderful Super Jewel DVD cases from PCX here in Australia and the cases I used pictured above can be found here. The great thing with these they have no tray/hub and I can store my clear stamps on both sides and my rubber stamps with static cling cushion will also fit theses cases, but the static cling cushion is thicker then the clear stamps so these will only fit on one side. I filled and numbered all the clear cases and then adhered the printed clear sheet that usually comes with a clear set onto a sheet of copy paper and filed them with the coordinating case number on the bottom of each page. The card info from each set is tucked in between the page, so I also have the info for each set. At first I thought there may be too much bulk, tucking these in the middle of the pages.. but it worked out fine and saved me time printing them out or fussing with them any further. 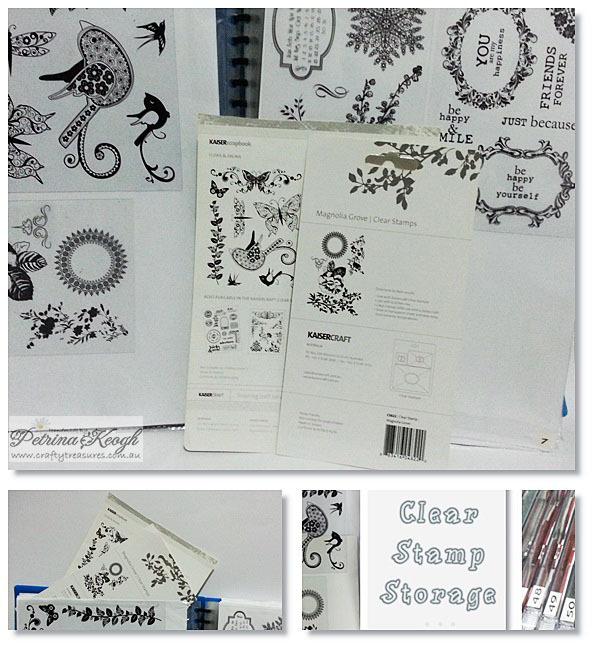 The rubber stamps and any clear sets that did not have the clear printed sheet, I simply stamped them onto the same copy paper and wrote the stamp details underneath each stamp and numbered them the same way. For me this works extremely well, I can now grab my display books and flip through and grab the coordinating set at a glance… it is soooo good to have them all sorted. 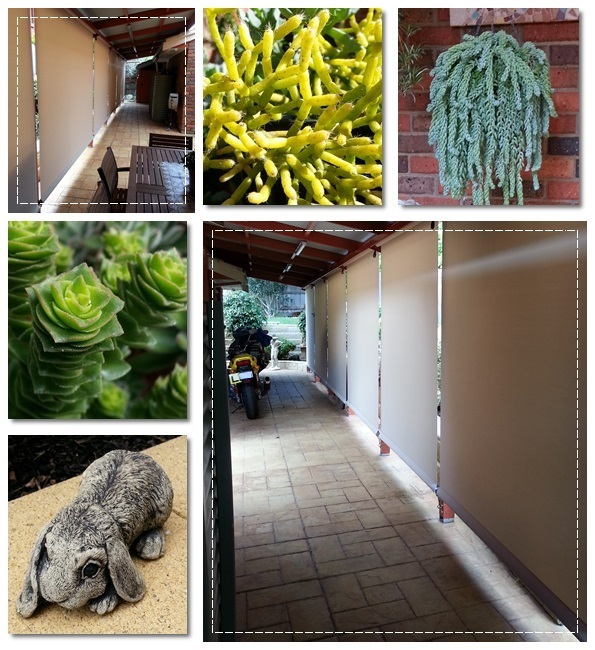 Here is a few pics of the side way/courtyard area with the outside blinds, a few plants that have been either potted, planted or moved & rehung. I decorated the pot in the top right hand corner pic with some terracotta paint and a foam stamp to match the surrounding brickwork etc. Found a cute.. bunny (garden ornament) for the garden in my travels too. Hi Crafty friends, I finished another bear just recently. 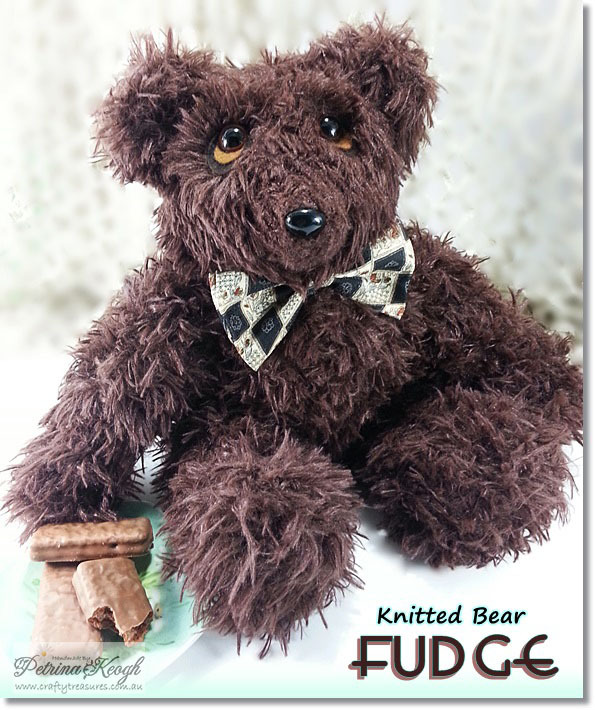 Meet my latest knitted bear project… named Fudge. He is so soft and fluffy and oh so cuddly. If you missed my last bear project, you can view it here. To knit up this project I used the same bear pattern designed by Jean Greenhowe from her pattern booklet Jemima Jane and Friends, it was also the same pattern booklet used for my previous bear projects. This time round I chose an All-Sorts (Polyester) yarn I spotted on sale at a Lincraft store a few months ago. It has knitted up quite well and incredibly super soft, but I also did intentionally stuff him lightly as well and just like soft chocolate fudge, he is a nice big softie! The bow tie pictured above has sentimental value, it belonged to my brother in-law. 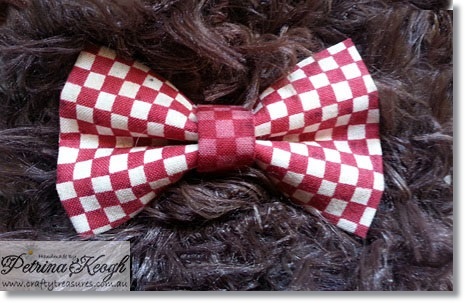 I also made Fudge another bow pictured below, so he has the opportunity of a change of bow ties when needed! I was recently asked, do I have a stash of made bears by now? The answer to this is no, they are either given as gifts, bought and given as gifts by friends and family. I have another bear nearly completed and one other in the pipeline, well it’s about a third done at this stage. 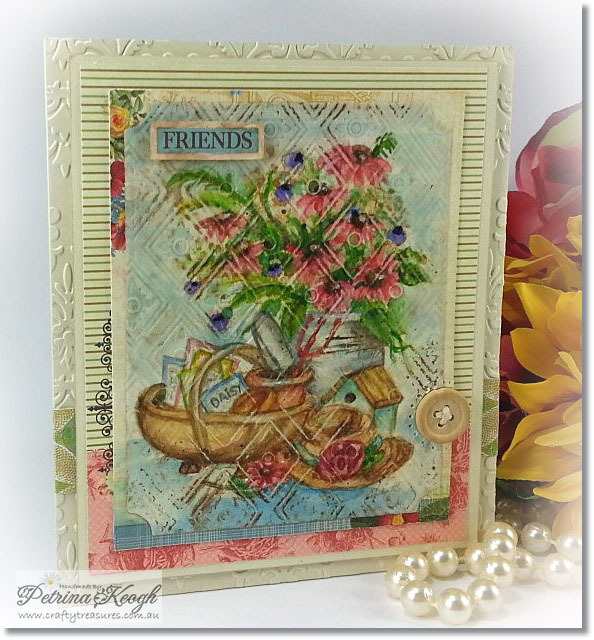 Hi everyone, I’m back with another quick card I made today for the Splitcoast Stampers Inspiration Challenge (IC462), Hosted by girlgeek101. Today’s challenge was to choose a piece of art that inspired you from Fine Art America and this was my inspiration Here. 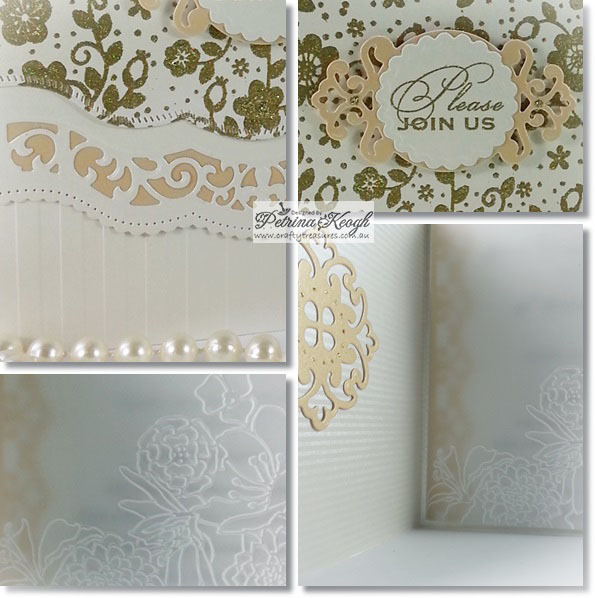 I dry embossed a piece of mid blue cardstock with elegant lines embossing folder and wiped this with whisper white and coloured sections of the embossed design with marvy le plume’s. Using a Goanna craft stencil I’ve had for many years and some white cardstock, I placed the stencil on top and coloured it with distress inks and applied a clear holographic foil and also gave it some detail with a black copic marker. I cut around the finished Goanna design and adhered it with foam adhesive. Next I placed the stencil in the top left hand corner and sponged another Goanna with distress inks and touch of black ink. I embossed a piece of lime green cardstock with the Mesh embossing folder and wiped over it with black ink and adhered this behind the main panels. I die cut the happy birthday with black CS and adhered this to the top right hand side. Hi Crafty friends, hope you are all keeping well and I am so glad you could pop in. Here are several watercolour cards I made recently, as mentioned in a previous post that it has been fairly busy around here of late and I feel like I am dragging my tail to get these up and posted, so today I have grouped them together to share my latest watercolour projects with you all. It has been a few years since I have played with my watercolour mediums, these projects I am using up some relatively cheap water colour pads I have collected over the years. I primarily used my watercolour pencils on my card making & parchment craft work in the early years of card making before many other mediums were introduced to card makers & crafter’s. Recently I was inspired to dig them out after seeing so many lovely watercolours lately and quietly have a play of an evening when I had time or not totally exhausted! It is really quite relaxing. This first one, I lightly hand sketched a Free Dover Publications image. What caught my eye with this one was both the vase and the beautiful floral display. I mixed some primary colours on a pallet and painted my lightly sketched image. I found while working with this 280 gsm watercolour paper it did buckle & warp slightly, but fixed this by turning the image side facing down and ironing it (with a dry iron, set with steam off) after a light fine mist with water. I layered this finished watercolour onto mixed designer papers and also dry embossed the panel behind the DP with a Portacraft embossing folder. This watercolour I also lightly hand sketched from a free image found online and sketched straight from looking at it on the PC screen. This time I used a different watercolour pad and different weight 180 gsm. Applying the same methods as my first watercolour to paint it, I actually found this to buckle even more, and also found it did not flatten as nicely either. I layered this watercolour onto some solid cardstock and then onto a dry embossed panel with the Wire Fence embossing folder. 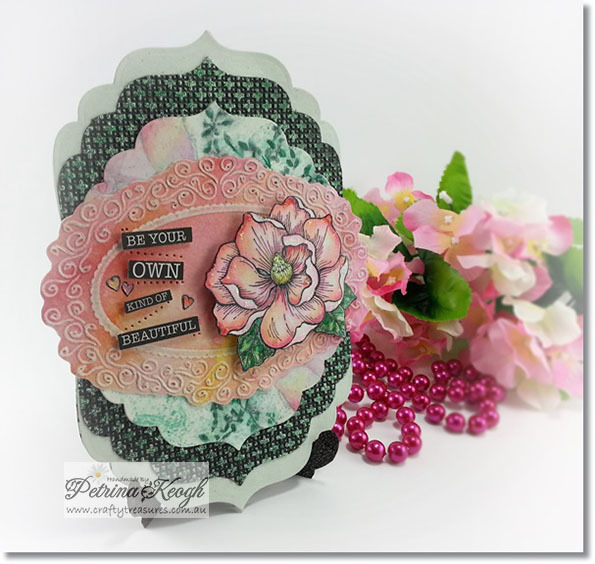 The border panel and tag are trimmed from the Kaisercraft – English Rose Collection. 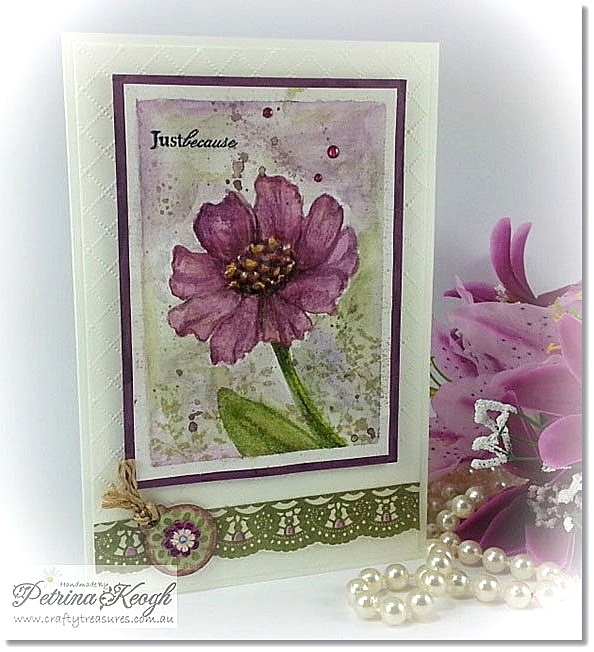 I embellished the card with an eyelet, flower sticker and some twine. This one was some background watercolour play with some 180 gsm WC paper and Koh-I-Noor – Watercolour/Stackable Wheels, these are grainier in texture, but do still produce quite strong colour. After it was all dry, I cut a piece to fit the embossing folder, dry embossed it and lightly sanded it to expose the original core colour. I already had the image stamped and coloured in a folder from eons ago! I do remember it was coloured with watercolour pencils and just highlighted it with some glitter glue. The sentiment is from the Kaleidoscope Collection – 6.5″ x 6.5 Paper Pad with some added paper piercing and small punched hearts. 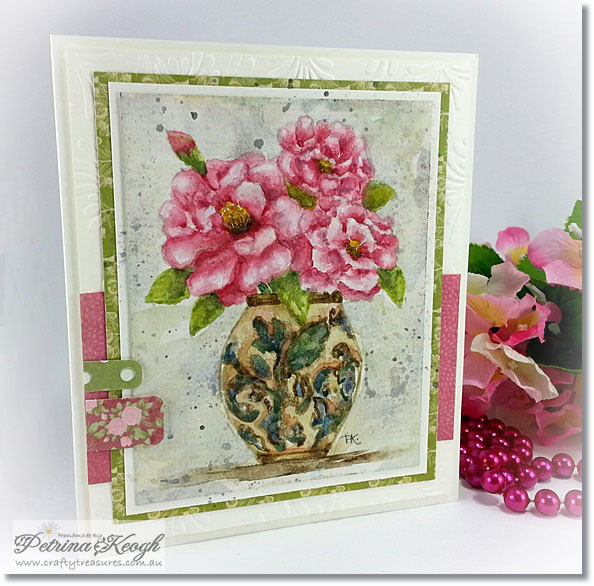 The panel behind the WC & main image was stamped with a couple of Kaisercraft clear stamps, Magnolia Grove and Rocks and coloured up. The black metallic green panels were die cut with Grand Labels 4, dry embossed with the SU – Square Lattice embossing folder and heat embossed with Allison Ellis embossing powder (this was 2 greens I mixed together). The base for the easel stop was first stamped with a Outlines WM rubber stamp (Discontinued) and coloured it with similar tones. The stop itself was die cut with Grand Labels 4 and cut again from about halfway within the shape and dry embossed with Wire Fence embossing folder. 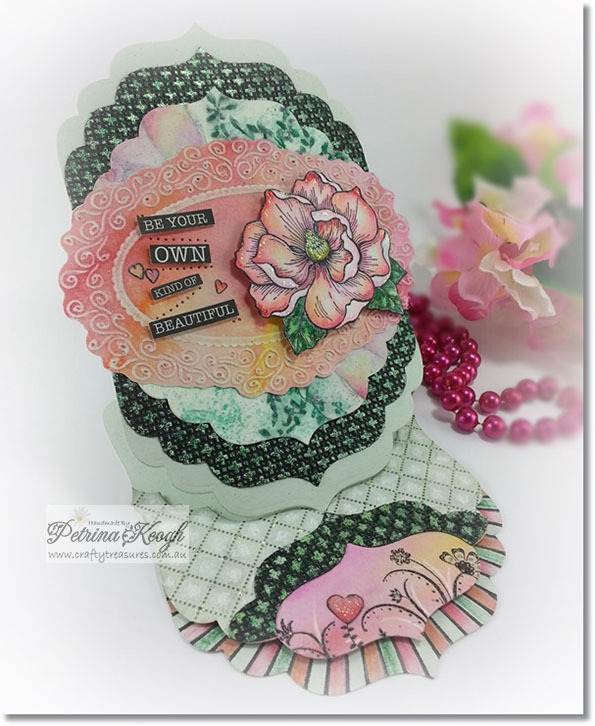 The lower portion of the stop was cut from the same coloured WC paper which I stamped with Kaisercraft clear stamps – Flourishes and added a punched heart and some white gel pen detail. For this final watercolour, I saw the stamping part of this technique somewhere online and was inspired and keen to give it a try while I had my watercolours out. I lightly stamped the Penny Black – Spring Planting (discontinued) with a light coloured distress ink onto some 180 gsm watercolour paper. I painted this one with the Koh-I-Noor – Watercolour/Stackable wheels. Next I dry embossed it with Diamond Trellis embossing folder and heat embossed this with clear embossing powder and wiped over this with a dark brown water based ink and wiped it off with a clean cloth so some the residual colour stayed in the crevices. To finish it off I layered the WC image onto Webster’s – Petite Papers and for the back panel I dry embossed it with the Jamara embossing folder and embellished it with a button. Hi Crafty friends, today’s quick card project I made for a male birthday. 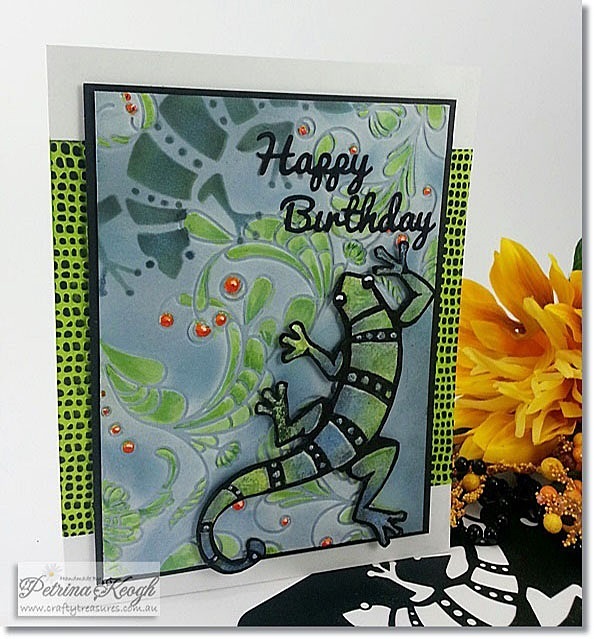 I started by dry embossing some colour core cardstock with a Happy Birthday embossing folder, sanded it with a fine grit sanding tool and distressed the outer edges with a paper distresser tool. 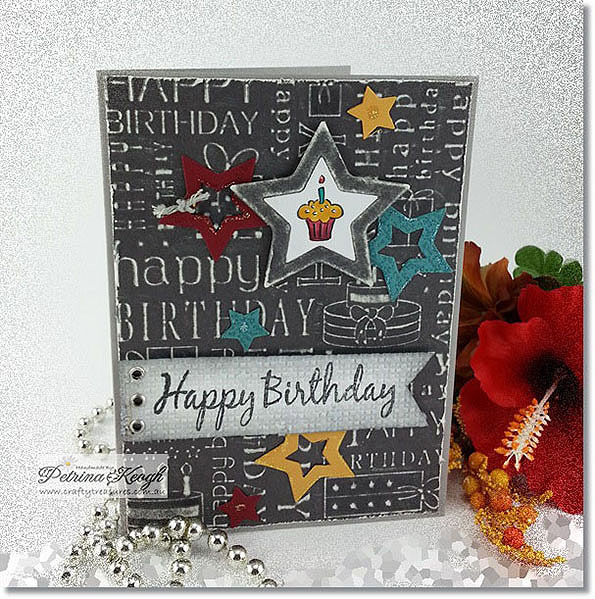 I die cut out some stars in a variety of colours from some scraps with a set of star – nested dies. Next I stamped a cupcake from a figures of speech stamp set onto a small piece of white cardstock, coloured it with copic markers and cut it out with the inner star shape and mounted these together with 3D foam adhesive. The sentiment I stamped with black ink onto some white cardstock and dry embossed it with square lattice embossing folder and embellished this with three silver brads at the left side of the sentiment and also adhered this onto the card 3D foam adhesive. 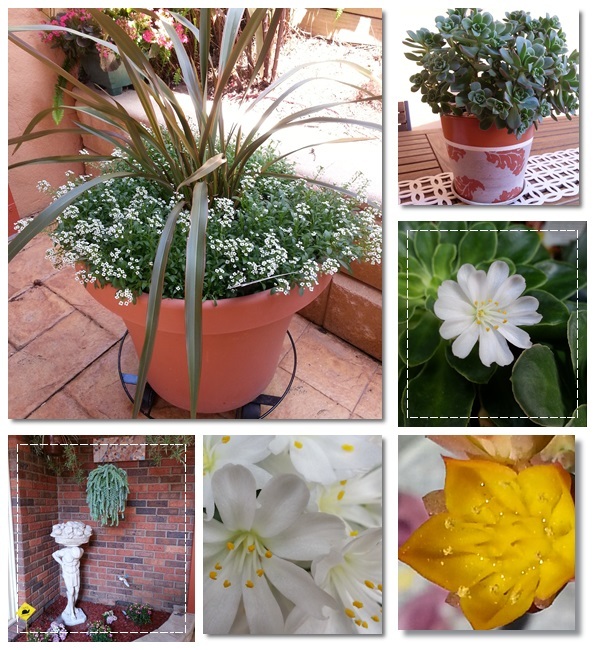 With some sunshine out today, I spent the entire afternoon in the garden… gardening and found one of the re-potted orchids was in flower and a few succulents in flower too.